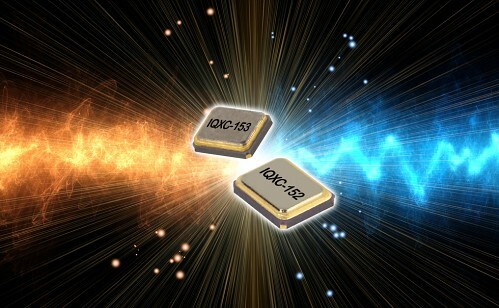 IQD has launched a range of quartz crystals which can operate in the fundamental mode up to 200MHz. The quartz crystals are housed in an hermetically sealed 2.5 x 2.0 x 0.6mm (IQXC-152) and 2.0 x 1.6 x 0.5mm (IQXC-153) ceramic 4 pad package, 2 of the pads are grounded to the metal lid to improve the EMI. In the higher frequency range, 70MHz to 200MHz, the frequency tolerance can be as low as ±30ppm and the stability is also ±30ppm over the full industrial operating temperature range of -40 to +85 degrees C with the capacitance load ranging from 8 to 30pF. The IQXC-152 & IQXC-153 enables design engineers to use higher frequencies in the fundamental mode which eliminates the need to use a PLL or a tank circuit picking up the 3rd, 5th or 7th harmonics. A higher starting frequency can also be used when looking to generate for example 2.4GHz which cuts down on the jitter/phase noise in the circuit.